"War turns us to stone. and rise to new days." -- Semaphore message of remembrance, London, November 2005. "Message", a semaphore message of remembrance, was transmitted along the River Thames in London today (Remembrance Sunday, 13 November 2005). The performance artwork was commissioned for the day by the National Maritime Museum, and was composed and arranged by artist Beth Derbyshire. 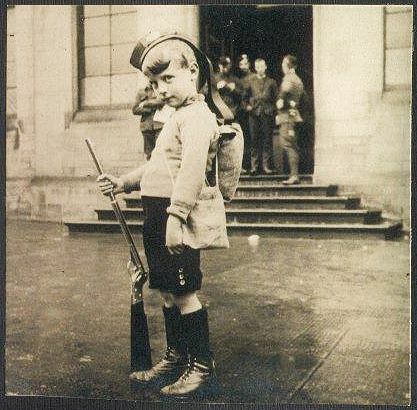 A young boy pretending to be a soldier. Review the list of books about the First World War currently available on Amazon.co.uk. "Duties": a poem by Lucy Brown that was partly inspired by the photographs on this website. The photographs of the cemetery in 2004 and 2005 were taken by Bernard Cousin, and are used with his permission. All rights in these photographs remain with him. Please email him at b.cousin@terre-net.fr to request permission to use any of these photographs. Thank you. The photographs of the Höffgen brothers belong to Roland Fogt, and are used with his permission. All rights in these photographs remain with him. You are welcome to copy and use any of these photographs for educational and other non-commercial purposes (please email Roland to let him know if you do). For any other proposed use of these photographs, please contact Roland at raf2004@sbcglobal.net to discuss. Thank you. All of the other WW1 photographs shown on these pages belong to my mother, Mrs J Smillie. All current rights in these photographs remain with her. You are welcome to copy and use any of these photographs for educational and other non-commercial purposes (we'd love to know about it if you do). For any other proposed use of these photographs, please email me at dms@zetnet.co.uk to discuss. Thank you. You will find a vast treasure trove of links to further information about World War One at http://www.teacheroz.com/wwi.htm - it's well worth a visit. For more information about the British Army and British soldiers in WW1, see "The British Army in the Great War" at http://www.1914-1918.net/ - an excellent site with lots of information and links to other quality sites about WW1. This Great War webring site is owned by Donna Smillie.